"Caution! Party bark is addictive. You can change the recipe up in many ways, but it's basically party mix covered in white chocolate bark. Makes a great gift." 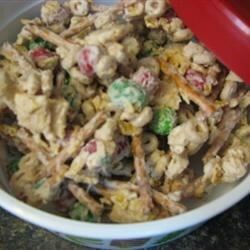 Combine chocolate-covered peanut candies, pretzel twists, oat cereal, and corn cereal in a large pot or bowl to make the party mixture. Melt almond bark in a microwave-safe bowl in 15-second intervals, stirring after each melting, 1 to 3 minutes total. Pour over the party mixture and stir well. Spread onto waxed paper. Sprinkle with sprinkles and cool, at least 10 minutes.